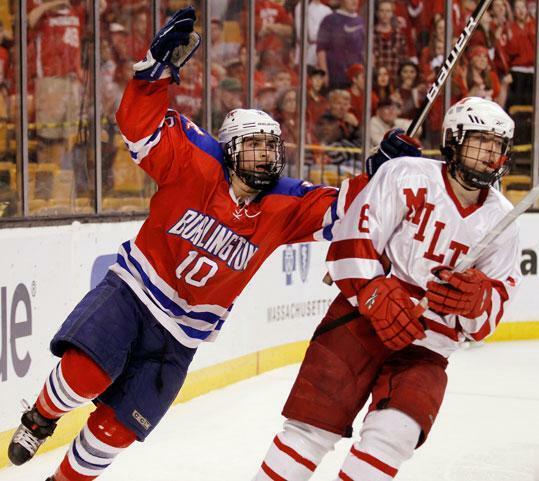 Joe Berardi (left) puts the finishing touches on Burlington’s victory with the sixth goal as Milton’s Jack O’Brien skates by. Burlington exploded for six goals and junior Derek DeCastro made 25 stops as the Red Devils defeated Milton, 6-2, to claim the Division 1 boys’ hockey state championship Sunday night at TD Garden. Burlington took an early lead on a goal from senior Brian Hood at 1:31 in the first. The first-line winger took a pass from C.J. Grinnell in the slot and slipped a wrister past Milton’s Jay Hankard for the lead. The Red Devils (18-2-6) netted an early goal in the second period, this one coming from senior forward Brett Romkey. Romkey, who netted 14 goals this season, skated to the right dot and sent his backhanded shot soaring past Hankard’s glove to double the lead. Milton (19-4-3) had a flurry of shots in front of the net with just under eight minutes to play in the second, but DeCastro made some stellar saves to keep the Wildcats off the board. Burlington opened a 3-0 lead at 8:24 in the second. Senior Joe Moran won a puck battle along the boards and put the puck in front where Adam Crowley was waiting to muscle it under Hankard’s pads. Milton got on the board in the second with a nifty play from Brendan Kelley to freshman Lloyd Hill to cut the deficit to 3-1. Kelley picked up the puck behind the net and slipped it to Hill who was waiting in the slot to net his sixth of the year. Burlington regained its three-goal lead less than two minutes into the third period. The Red Devils had a flurry of shots on Hankard, before Dan McMahon finally slipped a weak goal past the senior netminder. Burlington added another with a slapper from the left dot off the stick of senior Trevor Cimino at 1:16. The four-goal lead wouldn’t last long as Milton netted its second at 3:10 with a tally from Brian Higgins. Joe Berardi closed things out for the Red Devils with an empty-net goal to seal the victory with 46 seconds remaining.